Distributed audio systems, such as NuVo, require speaker wire and Cat 5 to be run to each zone for amplification and control. Now this can be installed with a single cable run! Save time and money while conserving in-wall space. 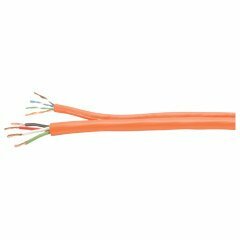 Twisted pair construction of the Cat 5e wire meets TIA/EIA-568-B.2-2001 performance standards, and ensures sufficient noise rejection and minimized far-end crosstalk. Four-conductor speaker wire provides power to both a left and right speaker. Available in 500 and 1,000 ft. spools. UL listed, RoHs compliant, and CM/CL3 rated.